Even if you’re not “a tech person,” competence in certain software applications like Microsoft Word and Excel are often baseline expectations for your job. 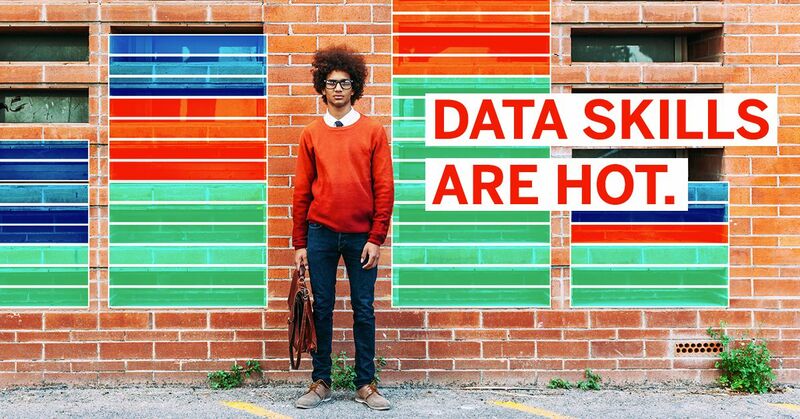 It’s no secret that we’re starting to say the same thing about data skills. Because every department at every major enterprise has already adopted or is moving to self-service analytics tools to make decisions derived from data, the demand for analytical talent is hotter than ever. In fact, there are now more than 60,000 data analytics jobs listed on Indeed.com and Forbes recently ranked Tableau as the technical skill with the third biggest rise in demand (after big data and Node.js). Here comes the jaw dropper— 40% of managers from a recent MIT survey said they’ve had difficulty hiring analytical talent. (That sound you hear is opportunity knocking.) This talent gap makes data skills the new competitive edge. The good news? Whether you’re looking to gain new analytical skills, take your career to the next level, or help your entire team become more data-driven, Tableau has your back. You can get started by watching our free on-demand trainings. This 16-part series offers short, easily consumable videos to take you step-by-step through the fundamentals of developing visual analytical skills. Not only will you learn how to connect to data sources and choose the best charts and graphs, you’ll also learn how to perform basic calculations and share your work with your peers. You can also check out our free starter kits to help you practice author and publish Tableau dashboards. If you’re looking to bring your team or an entire organization up to speed, consider enlisting Tableau services to accelerate learning curves and adoption in sync. If you prefer to learn analytical skills from a live person, you can sign up for live online trainings or even attend classroom trainings. And last but not least, one of the best (and free) places to learn, ask questions on-the-fly is in our world-class Tableau Community, where you’ll find and connect with more than 100,000 enthusiastic Tableau users. In fact, Gaëlle Periat, a gaming developer early in her profession, found so much support from the Tableau Community, and value from on-demand trainings, that she was able to quickly teach herself the data skills she needed to change the trajectory of her career. Her new found skills have helped her take two position leaps. Today she is the Data & BI Manager at Ubisoft Entertainment, a French corporation that creates popular digital interactive entertainment and offers related services. “I definitely don’t see myself pursuing any of my new professional projects in data without Tableau,” she said. So, what are you waiting for? Mastering analytics for your business or field can be more than savvy career move. The ability to deeply investigate your data at the speed of thought is a fundamentally satisfying thing. When you can add value, quickly identify opportunities, and pivot in time to make a difference, you become a respected voice at the table. And that can make your job even more fulfilling. Sometimes it's hard to know what employers are looking for when they're hiring. But right now, it's obvious. Check out our data skills resource page to learn more about how to boost your resume and advance your career, no matter what industry you’re in.